Home » Softwares » BlueLife Host Editor "A Windows Host Editor"
BlueLife Host Editor "A Windows Host Editor"
BlueLife is one of the greatest host editor program, which allows it user to edit, update their Windows host file entries and best host editor for Windows PC, especially for Windows 10 users. Windows host file is useful in blocking websites, redirecting one URL to another and assigning local domain name for any internet site. Host file managers are right tools to get rid of always finding Windows host file path and editing them again and again. 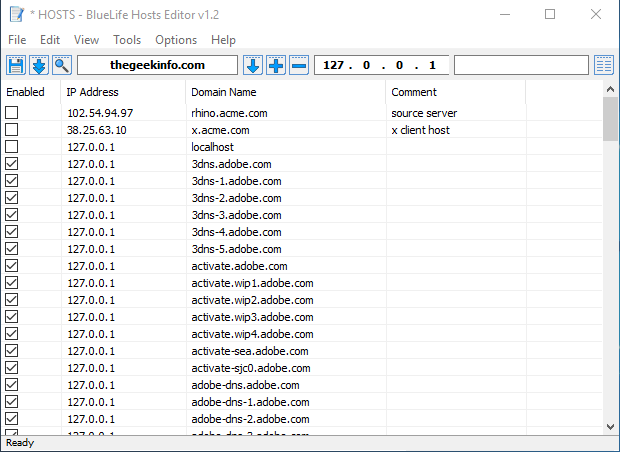 BlueLife host editor makes editing host file in your Windows machine way simpler and makes it easy to switch between multiple Windows host settings. After downloading BlueLife host editor extract the folder to any directory, you don't have to install the software because it is portable and this makes it easy to use. You can check Readme.txt file if you wanna get detail about bug fixes and updates. To run the program double click on "Hostseditor.exe" and you will a window with options to add and remove URLs from your host file for blocking, redirecting and assigning local domain. If you are having any trouble with your Windows Host file do let me know, I will try to help you. You can also block websites using Windows Host File, Redirect any website.